Be sure to remember options including student housing, townhomes, condominiums and properties on the Texas A&M University Shuttle Route near the TAMU campus. College Station, situated in the Brazos Valley of Central Texas, got its start thanks to the old Texas and Houston Central Railroad back in 1860. A decade later, the Texas Agriculture and Mechanical College (known now as Texas A&M University) came into being. The matching of the university and College Station’s agriculturally-based economy help cultivate and develop the area, bringing more people and diversifying the region. Today, College Station has became known as one of the Most Educated Cities in Texas. The university has expanded considerably to incorporate several new and advanced academic facilities. While the years have seen an increase in size and growth for the Brazos Valley, Bryan and College Station have continued to enjoy the benefits of the rural communities, thanks to the surrounding areas like Kurten, Navasota, Hearne, Caldwell, Mumford and Anderson. Many of these towns offer the beauty and placidness of the Texas countryside combined with culture and intrigue for the daytime tourist. What really makes College Station one of the best places to live, however, is the friendliness and spirit of the Aggie community. Below, you will find a number of excellent communities and neighborhoods that share this characteristic. Along with a description of each neighborhood will be a list of important details, such as school districts, proximity to the university, and other information we hope will make your search easier. College Station Texas is home to Texas A&M University – The Fightin’ Texas Aggies. In South Central Texas sits Brazos County along with Bryan and College Station. Population 100,000 up 52% from 2000. College Station got its start thanks to the old Texas and Houston Central Railroad. As the students came to Texas A&M University, the population quickly increased. Thanks to The University, College Station became known as One of the Most Educated Cities in Texas. Years ago the economy was predominantly agricultural based which was a great match for Texas A&M University. 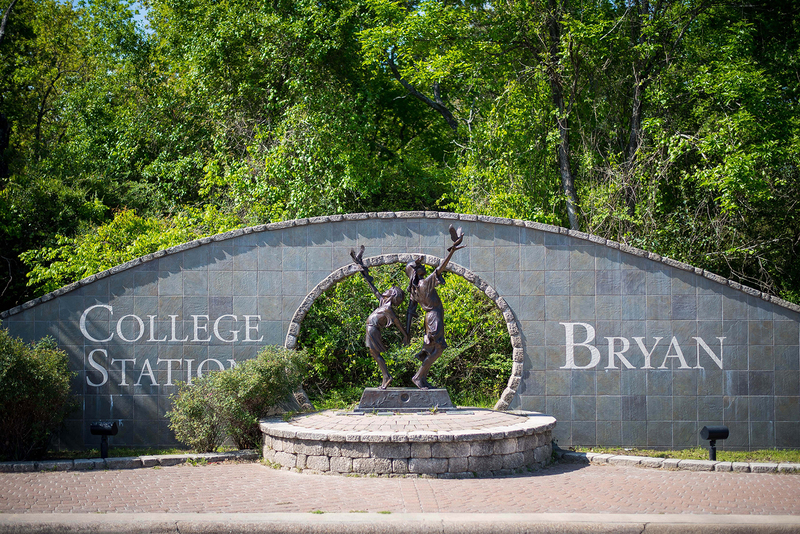 Bryan and College Station have continued to enjoy the benefits of the rural communities in the surrounding areas like Kurten, Navasota, Hearne, Caldwell, Mumford and Anderson but through the cultural diversity, academics and medical facilities, the cities are expanding to be known for much more. As the largest employer in the Brazos Valley, Texas A&M University employs over 30,000 residents. The Texas A&M System reaches far beyond the boundaries of Bryan and College Station into the cities of Tarleton, Prairie View, Laredo, Corpus Christi, Kingsville, Amarillo area, Commerce, Texarkana, Dallas, Houston and McAllen. The Texas A&M Health Science Center – The Texas A&M Health Science Center reaches across Texas through its six components: Baylor College of Dentistry in Dallas; the College of Medicine in College Station and Temple; Rangel College of Pharmacy in Kingsville; the Graduate School of Biomedical Sciences ; theInstitute of Biosciences and Technology in Houston; and the School of Rural Public Health in College Station and McAllen. Thanks to the University, professors and students, the real estate home sales market has remained strong throughout the last 15+ years. Texas A&M’s students number over 58,000. With that many students the investment market has also continued to grow. Texas A&M University Nutrition & Food Science Lynntech, Inc.
College Station, Texas has many parks, hiking trails, greenbelts and playgrounds throughout the city. With the job market in College Station and the addition of a great lifestyle it is easy to see why College Station real estate continues to shine. Real estate in College Station, TX has so many options from luxury homes, student housing, rural properties (country living) to affordable houses. College Station is known for its safe, relaxed and friendly neighborhoods and residents. Another option for housing includes building a custom home. Building your dream home is an option that is not available to many in other parts of the country but it IS an option in Bryan and College Station.